he events leading up to the civil war in Europe are briefly discussed, but as Britain was an onlooker to the happenings, we are only concerned with the effects this time of war had on the British Isles. The date is now 68 AD. News has reached Britain that Emperor Nero have been ousted and had committed suicide. Following this, Europe was is in the throes of a civil war. The Roman attention had been turned to matters abroad. with legions being taken away to serve the cause elsewhere. One legion that the Britons were glad to see depart was the dreaded 14th, so instrumental in the battle than defeated Boudicca. 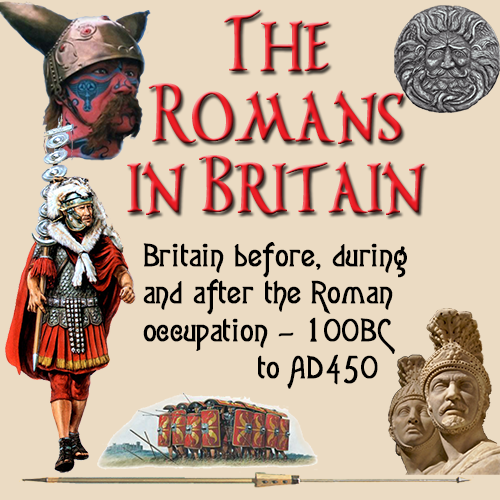 It is noteworthy, that the Romans had managed to pacify the British to the extent that they did not rise up and rebel, even though the Roman army was now well below strength. The upheavals that drove out Nero, his suicide and the replacement of him by Galba, Otho, Vitellius and Vespasian had effects throughout the empire. In Britain there were political wrangling amongst the Roman leaders. The governor, Trebellius Maximus was at odds with many of his commanders, Roscius Colelius, of the 20th legion in particular. Maximus was obviously favouring commanders who agreed with his policies which meant the legion commanders that opposed hi, were suffering by neglect. Coelius complained of the 'impoverished state of his troops'.. By this he meant the unrest that was running through his ranks. His troops were trained to fight, not to sit around observing the natives. The situation became to much for Maximus and he fled Britain, leaving it in governed by a committee of legion commanders. The troops of the proud 14th legion had earned themselves a bad reputation while in Europe. Instead of trying to solve the crisis, they had managed to pick arguments with just about every other force. They became out of control, probably due to their inbuilt desire to fight, and this being suppressed for so long in Britain. Adding to the fact they had been defeated at the battle of Bedriamcum. Defeat for the 14th was degrading and so they went on the rampage. Matters were brought to a head when they burned a section of Turin. The 14th were duly dispatched back to Britain. It was thought the lesser of two evils, as they were at odds with the legions in Britain too for their allegiance while in Europe. The then Emperor, Vitelius made a fatal mistake by executing troops from the side that had supported Otho. This enraged the legions that had supported Otho, seeing their fellow men killed by their own people. The 14th was now back in Britain, but were recalled to Italy to fight the enemy who were on their way from the Danube region. Bolanus The legions that had returned from the fighting were seriously below strength. Bolanus took the opinion that the British were liable to rise up if mush needed legions returned to Europe. In spite of the he was forced to send his troops into battle, close to the site of the Battle of Bedriamcum. Roman fought Roman in a vicious battle, with the British contingent being amongst the side that suffered a total defeat. It was a battle along Roman lines, where opposing forces either killed or took prisoner members of the other side. As the Roman legionaries would fight to the death, it was a bloody encounter with a high kill rate. The legion from Britain, being on the losing side, lost a great many soldiers. The victorious forces, under Flavian went turned on their own side and with customary bloodlust, destroyed the city of Cremona, killing any civilians in their path. Roman troops massacred Roman civilians. That is what civil war is all about. The great lesson from the 'Year of the four Emperors' was that Rome no longer made Emperors, they could be appointed elsewhere. This mean that the old adage of drawing from the two families of Julius and Claudius to make Emperors was over, It was now possible for anyone to have the chance of a throne. The key was in managing to muster support from the Roman army wherever they may be. Britain sided with Flavian, the overall winner of the civil war. Governors and commanders who had supported Otho were replaced. Coelius, the commander of the 20th, was replaced by Gaeus Julius Agricola, by chance the father-in-law of Tacitus, who was recording the Roman history of Britain. Agricola was bell known in Britain, having served under Paullinus during the rebellion of Boudicca.